We saw the strangest thing today at Parmer and Mo-Pac -- a British double-decker bus. It was complete with the driver on the right-hand side of the vehicle. We're not sure what it was doing in Austin, or where it was heading (maybe to Dell as it continued past I-35). Let me know if you have spotted this bus. It has my curiosity piqued. I had heard/read somewhere all the old double decker buses were being pulled from service in London and many were auctioned to the public. I had also heard some Americans purchased some buses. Could explain what it's doing here in Texas. The bus type in question is called the Routemaster. The previous poster is correct, they were pulled out of service in London last year. Lots of routemaster buffs abound, though I'm not one of them. According to http://www.routemaster.org.uk/links.htm#BusSales when these buses are sold they go for 2000 to 12000 GBP or about $3500 to $2200 USD. So is this just an individual driving her bus around Austin, or is it a tour company? I know we thought it would be cool to rent with a group of friends to visit several wineries. 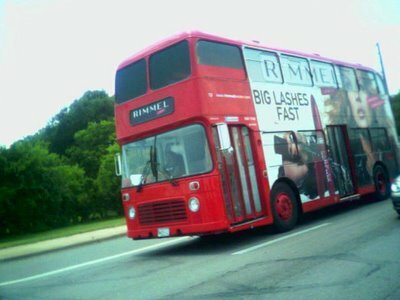 Coty Beauty has had a red double-decker bus on tour to promote its Rimmel cosmetics line since 2001; the vehicle continues to make the rounds of parking lots at Wal-Mart stores. Consumers who visit the setup not only get beauty consultations and makeovers, but also receive printed checklists of the products the makeup artists use. Consumers hop on the bus and head upstairs for “virtual makeovers”—brand reps digitally add different shades to a computer image of the guest’s face—and then receive a printout of their favorite looks and favorite products. Downstairs, professional makeup artists give Rimmel makeovers. The key to driving purchase, says Rick Goldberg, vp-cosmetics at Coty Beauty U.S., is the printed list. “Giving consumers a list of the products used for their makeovers makes it easier for them to go into the store and buy.” Rimmel measures initial post-event sales results by tracking figures for the four-week period after a bus visit. In 2005, the average boost was 32 percent (Agency: U.S. Concepts, New York City). That makes sense. We first saw the bus coming out of the HEB on Parmer and Mopac, and looked like it could have been heading to the HEB on Parmer and I-35. I did see the big cosmetics ad on the side of the bus, but had just figured it was some sort of paid ad, like what's on the side of a CapMetro bus.